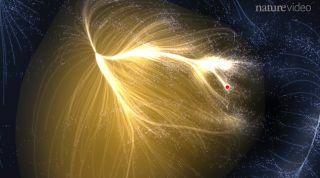 Scientists have created the first map of a colossal supercluster of galaxies known as Laniakea, the home of Earth's Milky Way galaxy and many other. This computer simulation, a still from a Nature journal video, depicts the giant supercluster, with the Milky Way's location shown as a red dot. In space, we're used to dealing with large distances and objects. In the cosmic scheme of things, Earth is small. Even in our solar system, we are easily dwarfed by the planet Jupiter (more than 1,000 Earths would fit in the planet, according to NASA) and our sun (more than a million Earths would fit in there, according to Cornell University). Even our sun looks puny when it is compared to the biggest stars we know of. The sun is a G-type star, a yellow dwarf — pretty average sized on the cosmic scale. But some "hypergiant" stars are much, much larger. Perhaps the biggest star known is UY Scuti, which could fit more than 1,700 of our suns. (Note that the margin of error is roughly 192 sun-widths, so at the lower end of the margin UY Scuti would move several ranks down the list of the biggest stars.) UY Scuti is only about 30 times more massive than our sun, however, so that shows that mass and size don't necessarily correlate in space. Progressing up the list of big cosmic objects, other things to consider are black holes and, in particular, supermassive black holes that typically reside in the center of a galaxy. (Our Milky Way hosts one that is about 4 million times the mass of the sun.) One of the biggest supermassive black holes ever found resides in NGC 4889, which has a black hole roughly 21 billion times the mass of the sun. There are things out there bigger than even supermassive black holes. Galaxies are collections of star systems and everything that is inside those systems (such as planets, stars, asteroids, comets, dwarf planets, gas, dust and more). Our own Milky Way is about 100,000 light-years across, NASA says; a light-year is the distance light travels in a year. It's difficult to characterize what the largest galaxies are, because they don't really have precise boundaries, but the largest galaxies we know of are millions of light-years across. The biggest known galaxy is IC 1101, which is 50 times the Milky Way's size and about 2,000 times more massive. It is about 5.5 million light-years across. Nebulas, or vast clouds of gas, also have impressively large sizes. NGC 604 in the Triangulum Galaxy is commonly cited as one of the largest; it's roughly 1,520 light-years across. Now at last we are starting to approach the biggest structures in the universe. Galaxies are often bound to each other gravitationally in groups that are called galaxy clusters. (The Milky Way, for example, is part of the small Local Group that comprises about two dozen galaxies, including the Andromeda Galaxy.) At first glance, astronomers thought that these structures were the biggest thing out there. In the 1980s, however, astronomers realized that groups of galaxy clusters are also connected by gravity and connected in a supercluster. What is the biggest supercluster? The biggest supercluster known in the universe is the Hercules-Corona Borealis Great Wall. It was first reported in 2013 and has been studied several times. It's so big that light takes about 10 billion years to move across the structure. For perspective, the universe is only 13.8 billion years old. The structure first came to light as the research team (led by Istvan Horvath of the National University of Public Service in Hungary) was looking at brief cosmic phenomena known as gamma-ray bursts. It is thought that they come from supernovas, or massive stars that explode at the end of their lifetimes. Gamma-ray bursts are thought to be a good indication of where huge masses of stuff lie in the universe, because big stars tend to congregate in dense areas. The first survey showed gamma-rays particularly concentrated about 10 billion light-years away in the direction of the Hercules and Corona Borealis constellations. But it's a puzzle as to just how that big structure came to be. A 2013 article from Discovery News (a partner site to Space.com) pointed out that this structure appeared to go against a principle of cosmology, or how the universe formed and evolved. Specifically, this principle says that matter should be uniform when seen at a large enough scale. The cluster, however, is not uniform. "I would have thought this structure was too big to exist. Even as a coauthor, I still have my doubts," Jon Hakkila, an astronomy researcher at the College of Charleston in South Carolina, said in a 2014 press release. He said there was a very small chance the researchers saw a random number of gamma-rays in that location, but it is far less than one in 100. "Thus, we believe that the structure exists," he added. "There are other structures that appear to violate universal homogeneity: the Sloan Great Wall and the Huge Large Quasar Group ... are two. Thus, there may very well be others, and some could indeed be bigger. Only time will tell." While the solar system is puny compared to the scale of the Hercules-Corona Borealis Great Wall, here is a list of some of the largest types of objects in our own solar system. Largest planet: Jupiter, roughly 88,846 miles (142,984 km) at its largest diameter, which is about 11 times the diameter of the Earth. Largest moon: Ganymede, which coincidentally orbits Jupiter, is roughly 3,273 miles (5,268 km) in diameter and is a little larger than the planet Mercury. Largest canyon: Valles Marineris on Mars, more than 1,865 miles (3,000 km) long, as much as 370 miles (600 km) across, and 5 miles (8 km) deep. Largest crater: Utopia Planitia on Mars, which has an estimated diameter of 2,050 miles (3,300 km). It was the general landing area of the Viking 2 spacecraft that landed there in 1976. Largest asteroid: 4 Vesta, which is 330 miles (530 km) across. It is located in the asteroid belt between Mars and Jupiter. Largest dwarf planet: Pluto is the largest dwarf planet, with a diameter of 1,473 miles (2,370 km). It was once thought to be smaller than dwarf planet Eris, but Pluto's measurements were confirmed up close by the New Horizons spacecraft in 2015. Editor's note: This article was corrected on Jan. 19 to include the size of galaxy IC 1101.